Mary Ann Todd Lincoln (December 13, 1818 – July 16, 1882) was the First Lady of the United States when her husband, Abraham Lincoln, served as the sixteenth President, from 1861 until 1865. She was raised in a wealthy and prosperous family. Her father was a close friend to Kentucky political leader Henry Clay of the Whig Party, Mary Todd developed a insatiable interest in politics and political issues. She supported the presidential candidacy of Whig William Henry Harrison. She studied a variety of subjects including the works of Victor Hugo, William Shakespeare, and astronomy. According to legend, her maternal grandmother aided slaves seeking freedom through the "Underground Railroad" and Mary Todd's later support of abolition is believed to have originated with the influence of this grandmother. Mary Ann Todd was born on December 13, 1818, in Lexington, Kentucky. Mary was one of seven children born to Robert S. Todd and his wife, Eliza Parker Todd. The Todds were a prominent family in Lexington. Mary's mother passed away in 1825, and her father remarried the following year. Mary excelled in school. She appeared in school plays and learned to speak French fluently. Mary was ambitious, scholarly, and an excellent conversationalist. In 1839 Mary moved to Springfield, Illinois, to live at the home of her older sister, Elizabeth Edwards. Mary was active and popular in Springfield's society, and she dated people like Stephen A. Douglas and Abraham Lincoln. Lincoln won her heart, and the two were married in 1842. Abraham gave her a wedding ring engraved with the words "Love is Eternal." Over the next eleven years the couple had four children. They were Robert, Edward ("Eddie"), William ("Willie"), and Thomas ("Tad"). Sadly, Robert was the only child of the Lincolns to live to adulthood. Mary was known as a very loving and caring mother. She was very devoted to her family. In 1844 the Lincolns bought a home in Springfield at the corner of Eighth and Jackson. Abraham had become a successful attorney and politician. In 1846 he was elected to the United States House of Representatives. Mary and the children lived with him in Washington for part of his term. After his first term he decided not to seek re-election and returned to his family in Springfield. Abraham concentrated on his law practice until 1854 when his mind again turned to politics. In 1856 he received some support for the Republican Vice-Presidential nomination, and in 1858 he engaged in a well-known series of debates with Stephen A. Douglas. He received the Republican nomination for President in 1860 and was elected over three other candidates—Douglas, John C. Breckenridge, and John Bell—in November. In February 1861, the Lincolns left Springfield headed for Washington D.C. Abraham was inaugurated as the sixteenth President of the United States on March 4, 1861. When Abraham won the election that year, civil war between the southern United States and the northern states was imminent. Before he even assumed office, seven southern states had seceded, with four more in quick succession after his inauguration in March. Although Mary dreamed of a proud entry into Washington, because of an assassination attempt, they had to sneak into the capitol. Her dreams were soon further crushed with harsh criticism, disappointments and more heartache. Southerners felt Mary was a traitor, turning against her roots, while Northerners felt she was a spy, as many of her relatives sided with the Confederacy. She received criticism when she refurbished the White House (which had become quite worn and shabby) because she went over the budget appointed by Congress. And she received criticism for holding festive events during wartime, but in doing so, Mary made the political point that the Union government would remain in Washington. In 1864, Abraham won re-election. He was shot by John Wilkes Booth in the Ford Theater during a performance of the play Our American Cousin on April 14, 1865. Mary was sitting beside him, they were hand in hand. She stayed at his bedside until he passed away at 7:22 a.m. the following morning. Following a state funeral, his body carried by train in a grand funeral procession through several states on its way back to Illinois. He was buried in Springfield, next to their son Eddie. Willie had been buried in Oak Hill Cemetery in Georgetown, Washington, D.C.. After Lincoln's murder, William's casket was dug up and moved to a temporary tomb until he was finally placed in a permanent tomb alongside the remains of his father and his brothers on September 1871. The deaths of her husband and her sons, Eddie, Willie and Thomas (Tad), in July 1871, in time led to an overpowering sense of grief and the gradual onset of depression. She slipped into a world of illusion where poverty and murder pursued her. 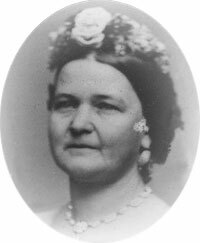 Mary Lincoln's behavior became increasingly eccentric causing concern for her surviving son, Robert. To gain control of his mother's finances, Robert committed Mary Lincoln to an asylum for the mentally insane in Batavia, Illinois in 1875, but she was free to move about the grounds and was released three months later. She never was able to forgive her eldest son for what she regarded as his betrayal, and remained estranged from him for the rest of her life. Mary Todd Lincoln spent the next fours years abroad taking up residence in Pau, France. Her later years were marked by declining health. In 1879, she suffered spinal cord injuries in a fall from a step ladder. She finally returned to the United States aboard an ocean liner in 1880, fellow traveler actress Sarah Bernhardt, prevented Mary from falling down a staircase and sustaining further injury. She also suffered from cataracts that severely affected her eyesight. This may have contributed to her falls. Mary Todd Lincoln died at the Springfield, Illinois home of her sister Elizabeth on July 16, 1882, aged 63. She was interred within the Lincoln Tomb in Oak Ridge Cemetery in Springfield. A sister was the daughter-in-law of Illinois Governor Ninian Edwards. A daughter of the Edwards married Edward L. Baker editor of the "Illinos State Journal" and son of Conngressman David Jewett Baker. A brother in law was CS General Benjamin Hardin Helm, son of Kentucky Governor John L. Helm. Governor Helm's wife was a first cousin three times removed of Colonel John Hardin who was related to three Ky. Congressman. A Cousin was Ky Congressman/US General John Blair Smith Todd. Nancy Lincoln, an aunt of Abraham Lincoln was married to William Brumfield; reportably William Brumfield was distantly related to a Susannah Brumfield who was the wife of Thomas Boone-cousin of Daniel Boone. Musician Sufjan Stevens, on his 2003 concept album inspired by the state of Illinois, dedicates a track to Lincoln, titled "A Short Reprise for Mary Todd, Who Went Insane, but for Very Good Reasons." Baker, Jean H. Mary Todd Lincoln: A Biography. New York: W.W. Norton & Company, Inc. 1987. Commire, Anne, ed. Women in World History: A Biographical Encyclopedia. Waterford: Yorkin Publications. 2001. Croy, Homer. The Trial of Mrs. Abraham Lincoln. New York: Duell, Sloan and Pearce. 1962. Fleischner, Jennifer. Mrs. Lincoln and Mrs. Keckly: The Remarkable Story of the Friendship Between a First Lady and a Former Slave. New York: Broadway Books. 2003. Helm, Katherine. The True Story of Mary, Wife of Lincoln; Containing the recollections of Mary Lincoln's sister Emilie (Mrs. Ben Hardin Helm), extracts from her war-time diary, numerous letters and other documents now first published by her niece, Katherine Helm. New York and London: Harper & Brothers. 1928. James, Edward T. Notable American Women 1607-1950: A Biographical Dictionary. Cambridge: Belknap Press of Harvard University Press. 1971, 1974. Keckley, Elizabeth. Behind the Scenes, Formerly a Slave, but more Recently Modiste, and a Friend to Mrs. Lincoln, or, Thirty Years a Slave, and Four Years in the White House. Urbana: University of Illinois Press. 2001. Neely, Mark E. The Insanity File: the Case of Mary Todd Lincoln. Carbondale: Southern Illinois University Press. 1993. Randall, Ruth Painter. Mary Lincoln: Biography of a Marriage. Boston: Little, Brown. 1953. Randall, Ruth Painter. The Courtship of Mr. Lincoln. Boston: Little, Brown. 1957. Schreiner, Samuel Agnew. The Trials of Mrs. Lincoln: the Harrowing Never-Before-Told Story of Mary Todd Lincoln's Last and Finest Years. New York: D.I. Fine. 1987. Van der Heuvel, Gerry. Crowns of Thorns and Glory: Mary Todd Lincoln and Varina Howell Davis, the Two First Ladies of the Civil War. New York: Dutton. 1988. Mary Todd Lincoln in 1862 Harper's Weekly Newspaper. History of "Mary Todd Lincoln"
This page was last modified on 30 August 2018, at 14:41.